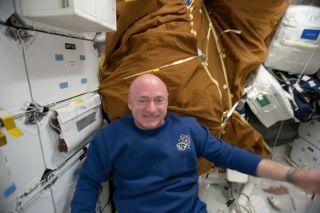 NASA astronaut Mark Kelly, STS-134 commander, is pictured on the middeck of space shuttle Endeavour while docked with the International Space Station on May 23, 2011 during the shuttle's final mission. HOUSTON — Space shuttle Endeavour's commander, Mark Kelly, may be orbiting 220 miles above the planet, but he will be able to share some of his spaceflight experience with his wife, wounded Arizona Congresswoman Gabrielle Giffords, back on Earth. "I plan to do it from the Cupola, to give her a chance to look outside, and look at the space shuttle docked to the space station," Kelly told reporters in a live interview this morning. "That's an incredible view. I've been speaking to her every night before I go to bed. It'll be nice to do it by video, see how she's doing and have her join us on space station for a little bit." Giffords, D-Ariz., suffered a gunshot wound to the head in January, in an assassination attempt at a community outreach event in Tucson, Ariz. Six other people were killed in the attack. Just two days after Endeavour's launch on May 16, Giffords underwent cranioplasty surgery at Memorial Hospital in Houston while her husband and his shuttle crewmates docked their vehicle at the International Space Station. During the surgical procedure, doctors replaced a piece of Giffords' skull with a plastic implant. "I think she still has bandages on," Kelly said. "I haven't really thought about what to expect." Congresswoman Gabrielle Giffords (right) with her husband, NASA astronaut Mark Kelly. "Hopefully it'll be on a day pass, so I can show her some neat views of the Earth," Kelly said. Endeavour's STS-134 astronaut crew is currently flying a 16-day mission to deliver a $2 billion astrophysics experiment and other supplies to the International Space Station. It is the 25th and final flight of Endeavour before the shuttle is retired along with the rest of NASA's orbiter fleet later this year. You can follow SPACE.com Staff Writer Denise Chow on Twitter @denisechow. Visit SPACE.com for complete coverage of Endeavour's final mission STS-134or follow us @Spacedotcom and on Facebook.